This past weekend, our cohort had the pleasure of attending our second integrative session, with a focus on negotiations. 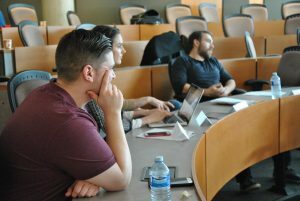 There are two Integrative sessions provided throughout the Corporate Residency MBA, providing students with the opportunity to learn skills in a high-pressure time-sensitive environment that simulates a real-world event. Hugh McNamara, Alison MacPherson, and Brett McNeil engage in their negotiations. The first integrative in which the Class of 2018 participated was a live case with a mergers and acquisitions theme. During this live case, our class were separated in various teams comprised of a variety of roles (such as financial advisors, board members, etc.) representing different companies like Salesforce and Microsoft. In order to make this experience more realistic, updates to the simulation environment were provided at various points throughout the two days. 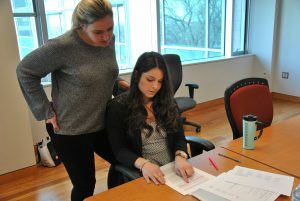 Lauren Murray and Rebecca Carr plan their next steps. 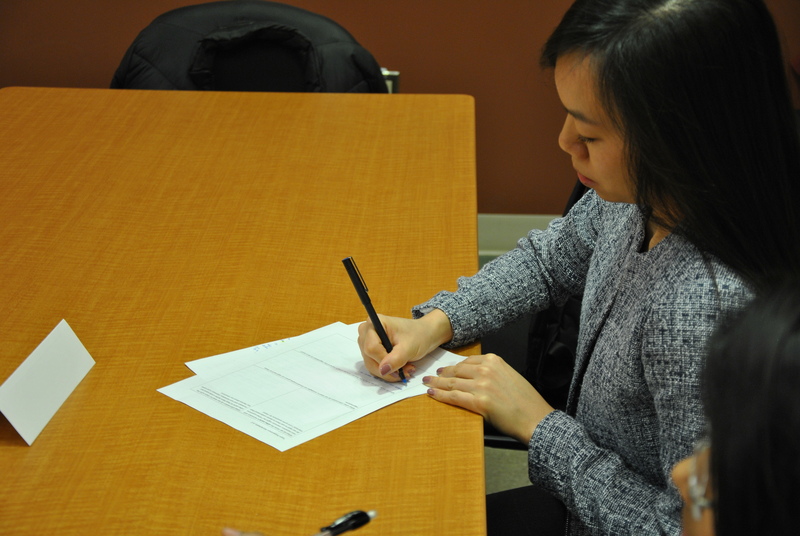 The second integrative, held this past weekend, was a complex negotiation simulation. A combined event with Master in Public Administration students, this event began with an address from the keynote speaker, Graham Steele, previous Nova Scotia Minister of Finance. Following this, we received a presentation regarding our case by Grant McDonald, SPA lecturer and retired Civil Servant. This case provided our class with the opportunity to role play as governmental departments and non-governmental organizations. The negotiation involved a contractual agreement between a not-for-profit organization working with at-risk youth and a provincial governmental body. Each team was given general information available to both parties, as well as confidential information unknown to the opposing party. Managing competing interests and sensitive information, groups were paired up and sent to work out an agreement. With competitive spirits and differing objectives, the tables were set for intense discussion. Karah Lee drafts her team’s contract. Perhaps unsurprisingly, teams reconvened at the end of the day having learned to work towards collaborative win-win solutions. One common theme discussed in the debrief was the sharing of information: while at first felt reluctant to “reveal their hands,” numerous teams felt that a common solution only really began to develop after each side’s interests and desires were freely shared. The Integrative Sessions are just one element of how Dalhousie’s Corporate Residency MBA prepares its students for effective employment. To learn more on program details, visit the CRMBA website.